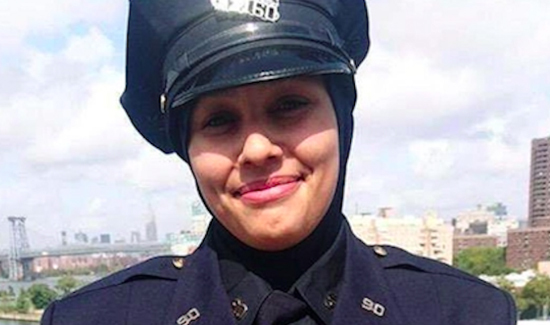 Muslim New York City police officer who has been decorated for her life-saving bravery in the line of duty was threatened and harassed on Saturday for wearing her hijab. According to the New York Daily News, Officer Aml Elsokary was off duty on Saturday morning when she dropped off her 16-year-old son on a corner and went to park their car. When she returned to the spot on foot, she saw her son getting harassed and then shoved by a white man who appeared to be in his 30s. The Daily News said that Elsokary was in plain clothes and unarmed. She did not identify herself to the man as a police officer. Police are searching for the man and the NYPD Hate Crimes unit is investigating the incident as a bias crime. In 2014, Elsokary was awarded a medal for her bravery when she charged into a burning building to save an elderly man and a small child.